The new flagship in AMF’s Pro Sport stable is the just-released 770, and like its smaller sisters, this boat’s designed for the serious fisherman – though also for one who appreciates a little form with pure functionality. It would be easy to dismiss the 770 Hard Top as simply a scaled-up version of AMF’s popular Pro Sport models (the 580, 610 and 660), but that would do it a disservice. While its design pedigree is obvious, the 770 also introduces a number of enhancements: it’s an out-and-out fishing platform with refinements – and it’s an attractive package. As before, the concept’s a collaborative effort from the pens of AMF managing director Brian Collings and project & development manager Paul Sharratt. Collings says the decision to build the prototype stemmed from dealer network feedback – in New Zealand as well as Australia. "The recurring theme was: we-love-the-660-but-a-slightly-bigger-one-would-be-fantastic. And we thought: well, why not?" It says something about the experience and synergy of the design partnership that the first 770 off the blocks performs so successfully. She’s a big, imposing boat with a hint of what I’d call aggressive, ‘predatory’ lines, but she handles sweetly and her relationship with the 225hp four-stroke Yamaha on the back is purrrr-fect. The boat was sold before it was finished and the new owner is reportedly over-the-moon. This first 770 debuted at the recent Auckland Boat Show (a second one is nearing completion) and attracted plenty of interest. As with previous AMF prototypes, construction was fine-tuned at the company’s Tauranga studio/workshop, but the jigs are now being moved to the production line environment of AMF’s Wanganui factory, where building will begin in earnest. 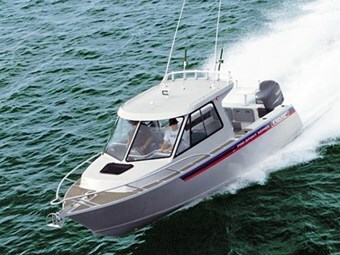 AMF’s Pro Sport boats tend to be favoured by fishermen who like venturing far offshore in search of exceptional fish. They have a reputation as solid, tough, sea-kindly vessels, and after examining the partly-constructed second hull (just off the jig), I’d say the 770’s not going to spoil that legacy. Like the other models in the Pro Sport series, the 770 hull combines a fairly fine entry and sturdy shoulders with a variable deadrise that flattens to 18 degrees at the transom. It’s entirely built from 5083 marine grade alloy. Hull plates are 6mm with 5mm sides, while the superstructure uses 3mm and 4mm plate. A keel bar runs the full length of the hull, and the beam chines are capped with a 90-degree profile (making excellent spray chines). There are no planing strakes. The hull’s exceptional strength comes from its fully-welded, internal structure: six longitudinal beams integrated with five cross frames (all 5mm plate, and all with a rolled lip on the top for added stiffness). Beams and frames are spaced 280mm apart, and the resultant box-construction provides immense rigidity, eliminating any chance of hull deflection. It’s all topped off with a 5mm treadplate floor in the cockpit, making for one large, flotation compartment – completely sealed and pressure tested. AMF has not yet made the transition to CNC-cutting of the hull components (it’s in the process of doing so), but one could argue that a major benefit of the traditional "rolling" and "forming" of the plates is aesthetics. The boat features rounded, formed corners rather than sharp, welded corners. They’re easy on the eye and undoubtedly kinder to hips and elbows. The sense of crafted aluminium is best obtained when standing on the side deck, looking forward. The symmetry and precision of the construction is evident. All AMF hulls are coated with Nyalic for added protection. As you might expect from a boat designed for chasing trophy fish, there’s oodles of space. The owner’s equipped it with two Springfield pedestal seats bolted to the forward end of two large storage bins – and that’s it. The cockpit’s reserved for wrestling large fish into submission, and there’s easily enough room to fit a fighting chair. The swivel seats work a treat – adjustable fore and aft and up and down – and they’re particularly useful for helmsmen who prefer to stand. The seat can be manoeuvred to form an ideal bum-rest to suit your frame. There’s plenty more storage in the shelves running down the sides of the cockpit (they continue through the bulkheads and into the cabin), and under the squabs in the cabin. I liked the tackle box built into the port storage bin. 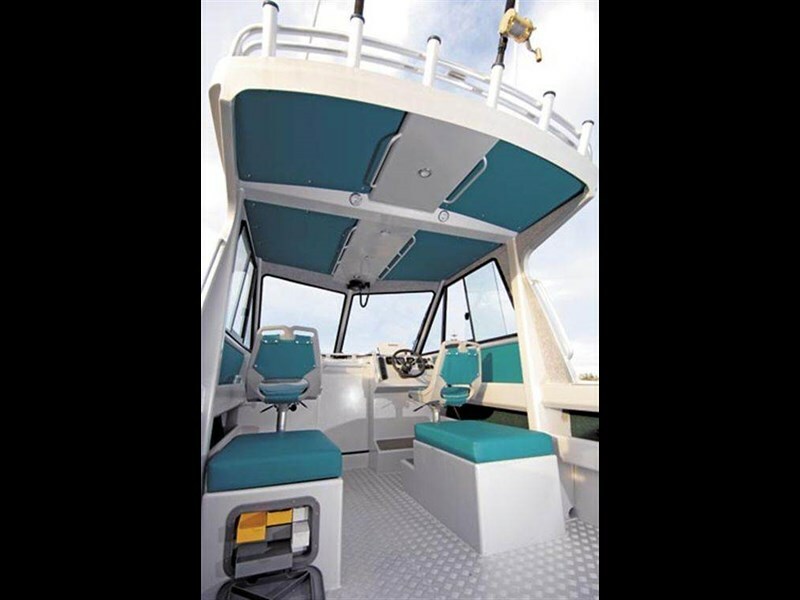 Lockers built into the transom offer additional storage space and also contain gear such as the trim tab’s hydraulic pump and the batteries. A live bait tank is also built into in the transom, and an acrylic door in the walk-through leads to a generous boarding platform and swim ladder. 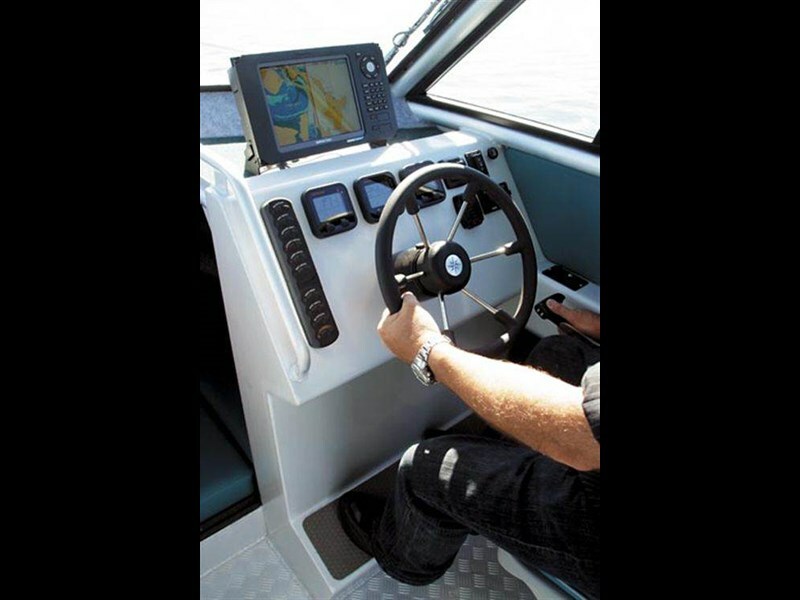 The owner’s intent about serious fishing is best illustrated by the superb CX44 Simrad chartplotter/fishfinder mounted above the helm, coupled to a 1kW transom-mounted transducer. Naturally, the hard top’s adorned with rocket launchers. Given its design brief, this boat and its crew will inevitably find themselves in testing conditions, and AMF has obliged with plenty of grab rails, including sets welded under the hardtop roof. There are more across the dash, on the rear of the hard top and on top of the roof – useful when going forward along the side decks. AMF Pro Sport boats have never been unattractive, but the company has lifted the standard with the 770. Examples of the its refined features include the chromed, foldaway cleats on the transom corners, the green vinyl panels used on the hard top ceiling, and the array of halogen lights mounted in the ceiling. The aft end of the hard top contains more halogens, facing aft to illuminate the cockpit during night fishing sorties. Classier than AMF’s traditional carpet surfaces, I’d suggest the vinyl panels also make a contribution as an effective sound-deadening medium. They’re manufactured from timber, foam and vinyl. I also like the wiper and washer fitted to the helmsman’s windscreen. It has a dedicated tank located in the cabin. Sliding windows (Seamac) are fitted to the sides – all carry 6mm toughened glass – and collectively they offer excellent visibility. Even with is existing configuration, the boat would be a comfortable overnighter. 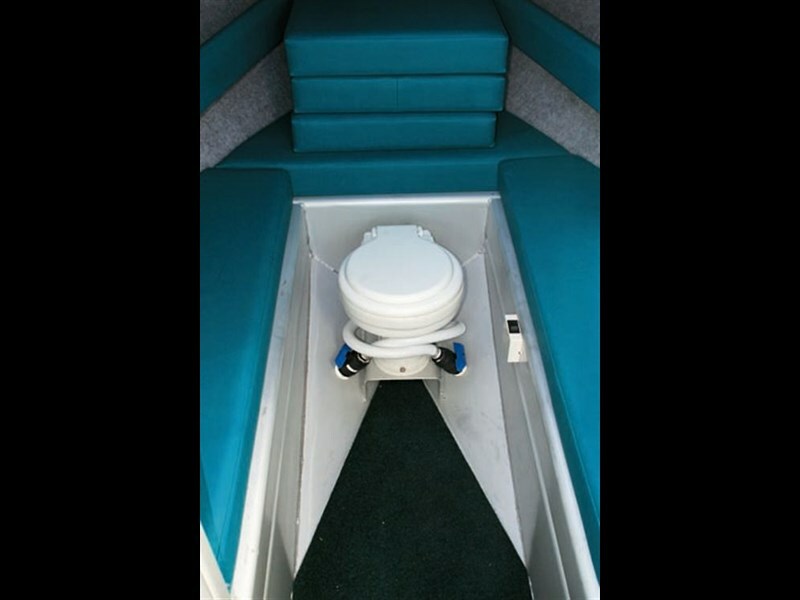 The cabin up front is equipped with an electric toilet (tucked midships, under the squabs), a large hatch for ventilation and light, and sleeps two in comfort. A sliding aluminium door in the cabin bulkhead should keep you relatively toasty. But if you wanted additional living space, it would be easy to enclose the hard top entirely: you could fit a bulkhead and door to the sturdy frame located at the rear of the structure. The 770 is fitted with twin Orbital gel batteries (one house, one start) making full use of the Yamaha’s twin-output alternator. The owner also wanted to be able to trickle charge the pair with shore power, so Collings devised an easy solution: he fitted a conventional trailer electrical connector to ensure shore power could only be plugged in the correct way: no danger of reversing the polarity. Collings reckons the ideal engine for the 770 is a 250hp outboard, and while this would undoubtedly boost the boat’s performance, I couldn’t really fault the 225hp Yamaha. He’d experimented with various props during sea trials, settling on a 19" unit. "We tried a 17" and a 21" and the 19" provided the best compromise between hole-shot performance and top-end speed." For a big boat, she gets up onto the plane quickly and cruises effortlessly. She’s fitted with trim tabs, but we didn’t use them at all – experimenting instead with engine trim. Collings says the trim tabs were fitted (in part) to be able to counteract any drag from that large, 1kW transducer. I’d never suggest that a boatbuilder’s being too pedantic – but I couldn’t detect any effect from the bracket. At cruise speed (4200rpm – 42km/h), the Yamaha’s fuel meter says its sipping 39 litres/hour. At WOT (6200rpm) that changes to 62km/h (32 knots as per GPS) and 80 litres/hour. By experimenting with engine trim (trimming up), we were able to improve that to 6700rpm and 70km/h (GPS = 36.2 knots). The built-in, underfloor tank carries 275 litres. She glides effortlessly over the waves, the sealed flotation chamber doing a good job in muting sound. I was most impressed with the beam chines’ ability to hold the boat rock-steady in an ever-tightening turn. We threw her into hard turns, and kept turning until the helm was hard over, but she never once even hinted at slipping. Bit like being in a Spitfire, I’d suggest, trying to out-turn a Me 109. During our high-speed antics, I couldn’t help noticing the performance of the CX44 and its 1kW transducer. I’m not sure that you’d ever want to be looking for fish at 30 knots, but for what it’s worth, the transducer provided the Simrad with an unwavering image. Custom-built by AMF for the 770, this trailer’s a work of art in its own right. Constructed from aluminium, its tandem axles are fitted with stainless steel callipers and sintered bronze discs. Collings has moved away from the traditional, multi-roller design and instead gone for keel rollers and two hull support strips. A V-shaped, nylon-covered guide at the "entrance" of the trailer does a great job feeding the hull into its correct position when retrieving: no danger of the keel getting caught on the wrong side of articulated hull rollers. The entire 770 package – boat, engine and trailer – weighs in at 2850kg, and ran easily behind our 4.2-litre Toyota Landcruiser tow vehicle.